Though I'm not quite as late as last time, I'm once again leaving it to the last minute to join Bella's Second Hand First link-up over at Citizen Rosebud. The photo is last-minute too. I rushed away to work right after it was snapped. That's probably why my photographer, aka Hubby, didn't mention the shirt. Of this outfit, three pieces are new to me. The skirt and belt are thrifted. The chambray shirt was lifted. Last year many style bloggers praised the versatility of chambray shirts. (Or maybe it was the year before. I really don't keep up.) You could dress it up. You could dress it down. Fashionable women were seen wearing chambray with leather, and chambray with tulle. The really brave wore chambray shirts with jeans and risked being accused of wearing a Canadian tuxedo. Though I've never paired them with leather, tulle or (yikes!) denim*, I've had chambray shirts in the past and quite liked them, so I happily leapt for that bandwagon... and almost missed it. In spite of reassurances that they'd be easy to find second-hand, I didn't find one. I searched everywhere. I eventually expanded my search to include new items and experienced a different kind of failure. They were all more fitted than the chambray shirts of my youth. None of them buttoned over my chest. I had given up on my chambray dreams until one day, while peering into our closet, I spotted one. On Hubby's side. Search complete. Stolen from your husband's side of the closet counts as second hand, right? Hope you'll head over to Citizen Rosebud to check out the stylish and resourceful women sharing Second Hand First. *OK, maybe I wore it with denim. I had permed hair too. Whatever. Laurie you look fantastic- love the skirt and it is expertly paired with the chambray shirt. Great outfit to link up with- and a big thank you for doing so. You rock! Thanks Bella! I'm loving the challenge of finding outfits for the link-up. You, and the other second-hand-first champions, regularly inspire me to think in new ways. YOU rock! 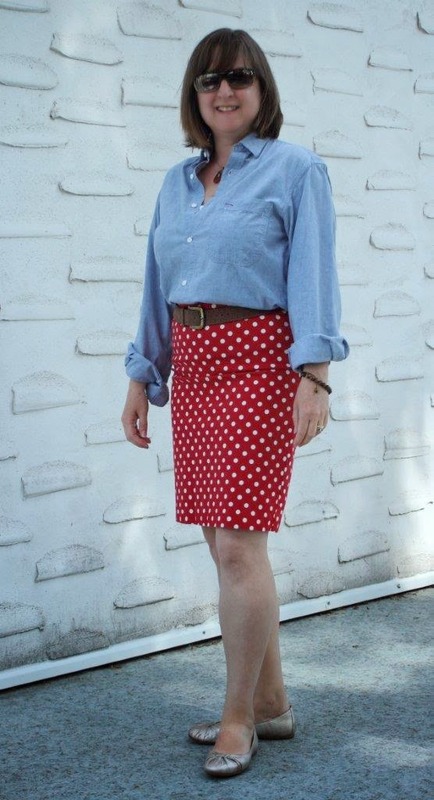 I love the polka dots and the chambray - perfect together! I want to find a chambray shirt, just like we used to wear in the '70s, but haven't found one yet. Not even on the other side of the closet. Thanks for mentioning the link-up. I was going to save mine for this coming Friday, but I linked up just in time! Thanks Val! Hubby hasn't changed much over the years, so most of the clothes he wore when I met him still fit. I doubt that the shirt is from the 70’s, but he's had it for so long it must be almost that old. Vintage Levi.